What would a 15% increase in profit do for your business? Discover The 10 Critical Insights That Every Supplier Must Overcome To Protect Their Profits! Yes! Send Me The Free Book(This is a Real Book, not a downloadable PDF. You are probably a business-to-business supplier who is committed to maintaining the contractual relationships with your clients, whilst being asked by your customers to do more for less without earning more profit. The lifeblood of your business depends on the current contracts of your long-term customers. Those contracts that you won over time, in most cases, are something to be proud of. You agreed to supply value to your customers and are, in turn, entitled to be appropriately paid for that value. For all intents and purposes, that should be the end of the story about the value exchange between you and your clients. But the truth is, it isn’t and you’ve probably, instinctively, known this for some time. What if you could be shown the hidden pitfalls lurking inside the current contractual relationships with your customers that are silently and significantly eroding your margins? Perhaps you have started to listen to your inner voice that says your business is being pushed for more than you originally intended – far outside the terms of your contractual agreements. Procurement warriors are overtly making their demands known, seeking to be rewarded for achieving a 3-5% reduction in supplier spend each year. This puts your entire operations, your staff and your supplier-customer relationships under increasing pressure. But challenges don’t just come from outside your business. What if you’re unintentionally relinquishing profit because your staff are unknowingly – but with good intent – over servicing customers, who then ultimately ask for more..? 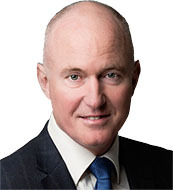 Paul Allen is Australia’s Leading Authority on Supplier Margin and the Founding Director of Margin Partners. For over 25 years, he has been immersed in different business-to-business categories, from beer to pies and paper to glass, helping organisations to unlock value with their contracted business partners. If you’re a supplier in the Asia Pacific region who is struggling to maintain and grow your operating margins, whilst ever-encroaching procurement teams stretch your resources with new demands, Paul could well become the most valuable resource you have on your team. As a senior sales, marketing & general manager, Paul has worked with some of Australia and New Zealand’s best-known companies and brands, including Lion, Simplot, TABCORP, Australian Paper and O-I Glass. He has negotiated with relentless procurement teams across Europe, Asia and America—and sold billions of dollars of goods to globally recognised brands. If you believe the lifeblood of your business lies in the certainty of long-term customer contracts, then Paul’s insights will compel you to rethink your “true cost to serve.” He exposes the fallacy of over-servicing and invites suppliers to contemplate how they can inadvertently relinquish millions of dollars every year by failing to monitor customer-specific net margin. In Take Back your Margin! 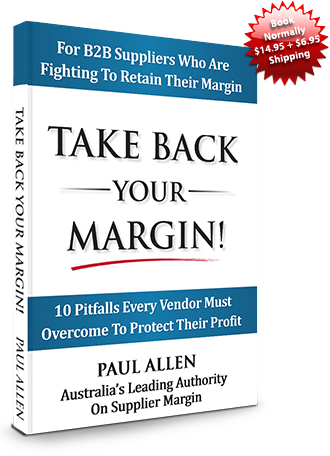 Paul identifies 10 critical pitfalls that every supplier must overcome to protect their profit. Through personal experience and detailed case studies, he shows business leaders how to swiftly, yet sensitively, reclaim the net margin that is rightfully theirs.